First of all, on this rainy, Illinois Tuesday, I’ve had a few questions about eating the pumpkin blossoms … and will we have pumpkins if we eat the blossoms? There are male and female blossoms. Hate to be cruel here, but the male blossoms are somewhat worthless. Pretty, but they don’t produce the goods. Oh, they help with pollinating, of course. But, their blossoms are on straight stems. 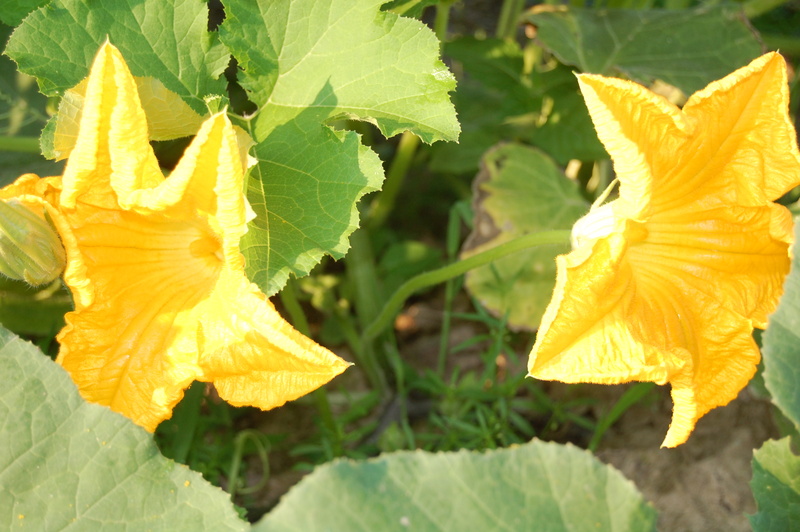 The female blossoms have the fruit (pumpkin), which form right at the base of the blossom. When I pick blossoms to eat, I pick the males. Female blossom: See that baby pumpkin at the blossom base? Now, however, some of the once-thriving pumpkin vines are starting to wilt. I was 99% sure it wasn’t due to insect-damage as we’ve been scouting tenaciously for the little buggars. After some research, it sounds like it could be root-rot due to the cooler, wetter-than-normal conditions. I was discussing this with the family last night as I cooked supper. I was trying to explain my theory – and became a little tongue-tied. It came out, “I think they have woot wilt.” The wilting leaves are a symptom. “I mean, woot wot.” DWAT! DRAT! “I mean ROOT ROT!” Pttuuieee. Spit it out, Marla. Don’t remind me that I am a communications major! So, what to do? Well, we checked for bugs. Again. Finally, we found one little cluster of some spidery looking things on one leaf. If it’s root rot, we just wait and hope it doesn’t affect all the plants. Hopefully, some of them will survive. The neighboring corn field has spots on its leaves. The crop-dusters have been spraying fungicide. I don’t think that is what is affecting the plants yet. Farming, on any scale, is a lot like gambling. Roll the dice and see what you get … but don’t bet the farm. Hopefully, our diversity will help, too. Maybe the gourds won’t be as susceptible as the pumpkin plants? Hopefully, the Indian Corn will be beautiful. In the meantime, I’ll scout, research, take good notes and chalk it up to my plan to always be learning. The lemonade from the lemons would also be … at least we had some good eating of the fried pumpkin blossoms before the dwatted woot wot. 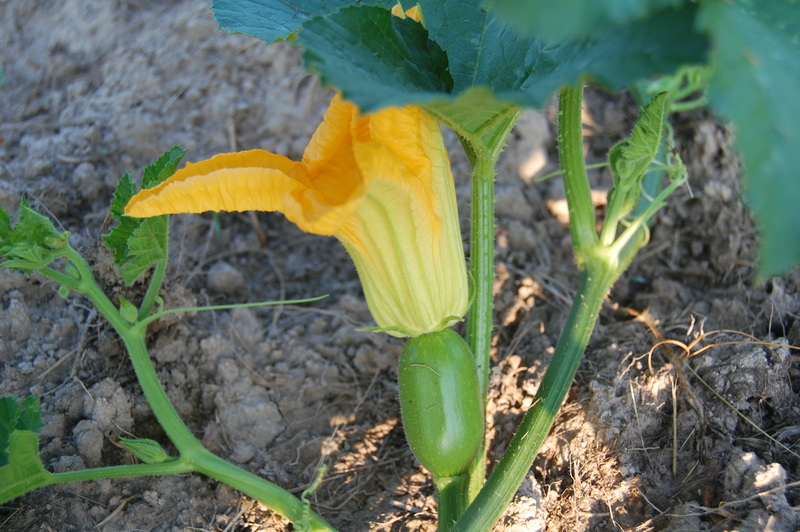 This entry was posted in Country Living, Positive Thinking, Work/Career and tagged Country life, farming, Fried Pumpkin Blossoms, gardening, gourds, Indian Corn, Pumpkin Blossoms, Pumpkin Patch, Root rot. Bookmark the permalink. 4 Responses to Pumpkin Problems? My pumpkin plant is doing the same thing!! None of my other vine plants are yellowing though, and they’re all climbing up the same cattle panel… Hopefully it won’t affect everything else. The wonderful, cool weather must not be so great for the pumpkins…. We’ve had a good bit of rain this summer, too, and I can see a difference in the flowers and herbs. Too much water is just as bad as not enough. It’s a strange problem, for sure! Last year we had extreme heat and drought … this year, cool and wet.